Find Cheap Flights to Hawaii: An Insider Guide. Strategies for an Affordable Hawaii Vacation! If you’re planning a family vacation in Hawaii, your search for cheap flights to Hawaii has probably already begun. And hopefully you’ve arrived on this page before making any airline reservations… I’m fairly certain you can benefit from my experience as a long-term Oahu resident who travels in and out of the Honolulu airport on a regular basis. And just so you’ll know where I’m coming from… I’m not in any way employed by the airline industry. I’m a passenger who has to pay for my own ticket just like you do. I’m not steering you toward some “exclusive” Hawaii airfare offer; and I’m not promoting dubious Hawaii vacation deals. I’m just sharing many years of accumulated wisdom about finding cheap Hawaii flights. The suggestions below are supplemental to the general information I’ve already outlined about air travel to Hawaii. If you have not already done so, please read about the cost factors that affect airfare to Hawaii; and you can follow the links back to this page once you’re done. 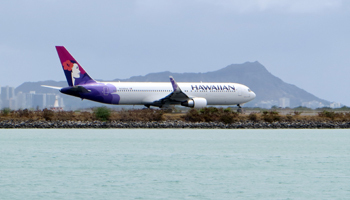 These tips are intended specifically for flights to Honolulu International Airport (HNL), but many of the principles can be applied to any air travel you may do in the future. Nevertheless, right now you’re looking for cheap flights to Hawaii, so I’ll approach everything from that angle. I’m also making the assumption – based on the fact that an internet search brought you here – that you’ll be making your own airline reservations through an online booking tool. That’s exactly what I’d recommend, because you’re the one who has the greatest incentive to find yourself the cheapest vacations to Hawaii. HINT: Before you can board any cheap flights to Hawaii, you may need to figure out your airport transportation situation. I’ve recently come across a couple of great resources that could help you save a small fortune on airport parking… If you just need to park your vehicle for the duration of your Hawaii vacation, try this: Save On Airport Parking At Over 65 US Airports . They say they can save you up to 70%. Or, depending on your distance from the airport and the times of your flights, you might want to overnight in a hotel near your airport. If that’s your situation, this seems to be a fantastic deal: Reserve Airport Hotel for One Night & Get Up To 21 Days of Parking for FREE! Also, since you’re planning your dream Hawaii vacation, you might want to be prepared in case of bad luck… Let Travelex Insurance protect your trip investment starting at $20! *Dates are approximate. Exceptions abound. In case it isn’t obvious, the ticket prices tend to be more expensive in the high season; and cheap flights to Hawaii can often be found during the low season – with plenty of exceptions. When possible, you should consider planning your budget Hawaii vacation during the off-peak months. However, if your vacation dates are tied to a scheduled break from work or school, then that’s when you’re going to travel. Don’t sweat it. Alternately, your Hawaii vacation dates could be governed by seasonal activities. Not to worry. That will mean you’re less likely to find cheap flights to Hawaii based on the travel dates – granted – but there are still ways to reduce the cost of a flight to Honolulu during the high season. If you apply the advice from any of these other tips, you could potentially get a better airfare than somebody who’s traveling in the so-called low season. Furthermore, there’s still a possibility that you find some fantastic discount flights to Hawaii. And even if you can’t find any Hawaii vacation specials, this site is full of free or low-cost Hawaii attractions that will help keep you within your overall budget. In general (not always), the lowest standard rates are available at eight to ten months in advance of your travel dates. But those might not be the best possible Honolulu airfares. If you really want to find the cheap flights to Hawaii, wait until approximately six to five months before your travel dates. That’s because this magic window is when the various airlines frequently (not always) tend to offer discounted airfare to Hawaii – especially for travel during the off-peak season. The airlines offer these discount Hawaii airfares as an incentive to generate increased reservations when they haven’t pre-sold enough seats by a certain date. To properly execute this waiting strategy, you’ll need patience and a bit of tolerance for risk, but it could result in significant savings. At eight to ten months in advance of your travel, use the online booking tools to identify the baseline Hawaiian airfare rate(s). Then check the rates every week until you start to see changes. Hopefully the first cost adjustment will be a drop in your favor rather than an increase. Either way, however, you should probably make your reservation immediately after you see the rates change; because the price will only increase from there. 1) Sign up for the Hawaiian Miles frequent flyer program at the Hawaiian Airlines Official Website and allow them to send you email promotions. Then you’ll automatically be the first to know when they’re offering discount airfare to Hawaii (link opens a new window/tab). 2) Consider getting an airline credit card to earn miles and save on baggage fees. Be aware, however, that these mileage program cards usually have an annual fee. Which Hawaii airline always offers the cheapest flights to Hawaii? That’s easy… none of them (or all of them, depending on your perspective). The cheapest airfare to Hawaii is a shy and elusive beast. You’re going to have to do some hunting if you want to find it. And even when you’ve found such a fare, it will change from carrier to carrier, day to day, and flight to flight. That’s just the way things work. In my constant search for the lowest airfare rates available, here’s what I recently discovered... I compared the costs for various dates from San Francisco (SFO), New York City (NYC) and Tokyo (TYO) round-trip to Honolulu (HNL). For almost every date/location variation I tried, the best rates were found using the booking tool OneTravel: "Domestic Travel Deals! Save up to $15◊ with Promo Code USA15. Book Now." Meanwhile, a very close second place for most date/location combinations (and best rate for the others) was found here: Save on travel at CheapOair.com (links open a new window/tab). For every travel date/departure location combo I tested, both of these services offered significantly cheaper airfares than booking directly with the airlines – even on the same airlines in many cases! Start with any online travel booking tool such as Expedia, Kayak, Orbitz, etc. (your choice, I’ve used them all and had satisfactory results with each). Plug in your dates and locations. Then check your results. Just from that initial query there should be one or two airlines that clearly stand out as the low cost leader(s). For me, that usually ends up being Hawaiian Airlines or United/Continental. Once you’ve identified the airlines that are offering cheap flights to Hawaii, you’ll have a choice to make. You can book the flight through the online travel tool, or you can make reservations directly from the airline’s web site. The advantage of working directly with the airline is that you save a few dollars in service fees. However, the benefit to booking with some (not all) of the online travel tools is that they will guarantee you the lowest rate if prices drop. Your choice. If there’s no obvious low cost leader and/or if the rates quoted threaten to give you a heart attack, try plugging in different search criteria (dates or departure location). If several airlines are offering cheap flights to Hawaii, lucky you. Forget about finding the cheapest airline and just go with your favorite! For me, that means flying on Hawaiian Airlines. From what I recall, every online booking tool I’ve ever used has flexibility options that allow you to compare rates on different days at different times and flying through different airports. By all means, take advantage of these features. It could save you hundreds of dollars and/or give you peace of mind that you’ve found the best flights to Hawaii. 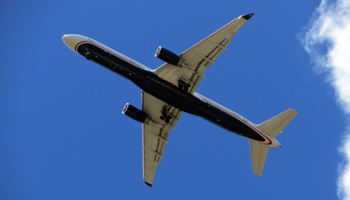 There’s nothing you can do about your location, which is one of the primary factors that affects the cost of your flight to Hawaii; but it’s likely that you have more than one airport within a reasonable driving distance of your home. Take advantage of that flexibility. Then consider the days that you’ll be flying. The cheap flights to Hawaii are often (not always) on Monday, Tuesday, Wednesday, or Thursday; and the rates generally (not always) increase for weekends and holidays. If you have the flexibility to vary your intended travel dates, a change from weekend to weekday could save you hundreds of dollars per ticket! Finally, even the flight time often (not always) makes a difference. The so-called “red-eye” overnight Hawaiian flights are often cheaper than the daytime flights – again, sometimes by hundreds of dollars. If you’re like me, though, and you can’t sleep on a plane, this is a tough trade for savings. You’ll see that this is one of the reasons I favor Hawaiian Airlines. In summary, there are numerous methods you can use to find cheap flights to Honolulu. And none of these strategies are mutually exclusive. Therefore, you should attempt to take advantage of all of these tips in order to maximize your savings. But like I’ve said before, don’t panic if you can’t implement one or more of these cost saving measures to book the absolute cheapest flight to Hawaii possible. Just get yourself the best deal you can, and I’ll help you save money throughout the rest of your Honolulu Hawaii vacation. This entire site is dedicated to helping plan Hawaii family vacations for any reasonable budget – and that includes yours! So fasten your seatbelt (by inserting the metal fitting into the buckle and then pulling the loose end of the strap until it’s low and tight across your lap) and put on your sunscreen, because you’re going to Hawaii! Disclaimer: Because airline industry information is subject to constant change, this page offers generalized and anecdotal information only. Individual experiences will vary. There are no guarantees stated or implied. Only the airlines and authorized airline booking services can quote guaranteed rates. This information is provided exclusively for the purpose of helping direct you in your search for the best possible itinerary.